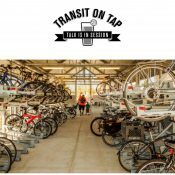 A new study published this week by the Los Angeles County Metropolitan Transportation Authority provides key insights into the integration of bikes and rail transit. The study could have important implications for TriMet, an agency that has struggled to find enough capacity for bikes on trains and that is actively building bicycle park and ride facilities at transit stations. The report from L.A., Bicycle-Rail Trip Analysis and Greenhouse Gas Emissions Reduction Focused Study, found that quality bike access on trains is crucial to a significant portion of daily riders and that rail transit systems that successfully encourage bike access (both at stations and on trains) can result in major reductions in auto use and greenhouse gas (GHG) emissions. The study utilized bike trip data gathered through surveys at 19 stations along Metro’s Orange Line, which runs 13 miles from North Hollywood west to Canoga Park. Researchers used the survey and trip data to extrapolate daily and annual bike trips at all stations in the Metro Rail network and then calculated annual reductions in vehicle miles traveled (VMT) and GHG reductions. Bicycle-rail trips would replace approximately 322,000 motor vehicle trips and reduce 3.96 million vehicle miles traveled each year, offsetting approximately 2,152 metric tons of carbon dioxide equivalents (CO2e) annually. This would be equivalent to taking 422 motor vehicles off the road. Bicyclists are universally using the Metro Rail system, with bicyclists reporting starting or ending their rail trip at 71 out of 73 Metro Rail stations surveyed. Over a quarter (27 percent) of bicycle-rail trips replace a motor vehicle trip. On average, 13 bicyclists per hour—one bicyclist every five minutes—enters or exits a Metro train during the weekday morning or weekday evening peak periods. 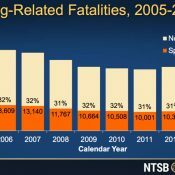 An average of 10 bicyclists per hour – one every six minutes – enters or exits a Metro train during the weekend midday period. 13 percent of bicyclists would not make their trip if they couldn’t bicycle and take the train. Respondents are more transit dependent than the general population, with 11 percent of respondents stating that they “rarely” have access to a motor vehicle and over a third of respondents (37 percent) stating that they “never” have access to a motor vehicle. In Los Angeles County, 9.4% of households do not have access to a motor vehicle. Survey respondents overwhelmingly said that being allowed to take their bike on the train influenced their decision to travel by bike and rail. Of the 477 people who responded to the question, 65 percent chose “allowed to take bike on train” as a factor that influenced their decision. Respondents with access to a motor vehicle are more likely than those without access to a motor vehicle to cite “allowed to take bike on train,” “no car parking at station,” “bike lockers at station,” and “have to pay for car parking at station” as factors that influenced their decision to bicycle. Women are much less likely to bicycle to a Metro Rail station than men. Bicycle use is growing in the Portland region as is our rail transit network. As TriMet and PBOT continue to plan for a less car-centric future, these lessons from Los Angeles could prove very valuable. — Download the 80-page study here (PDF). A bike stood vertically on its back wheel and hugged closely by its owner by one arm with the other arm holding an overhead handle takes no more space than a large man on a busy train. Of course Trimet would never advise doing this due to liability concerns. A strap could also be installed such that a bike would be somewhat shouldered by the owner close to his body so his arm is not tired by holding his bike the entire trip. Genius. just bring your own hook and you can use the straphanger rail anywhere in the train. The challenge isn’t only providing the space to store the bike, it is also providing a clear path to get the bike in and out the door. I suspect the authors don’t actually know whether that statistic reflects choice or necessity or some of both. But the phrasing (I’m channeling you here, Jonathan) makes it look like necessity. It will be hard to make transit recumbent-friendly, due to the bike’s size. As things stand, Tri-Met is pretty useless to us. We got warning citations for our ‘bents on Max a number of years ago and have not been back. They will not fit a bus rack at all. This may become more and more of an issue as the population ages and more folks gravitate to recumbents for ergonomic reasons. … and TriMet’s obliviousness to stair-sitters, cell phone-screamers, last-cigarette-drag-as-they-are-entering-the-train, sloppy-food-dropping, wide-as-a-60s-VW-Beetle-strollers and all other manner of fair use of transit violations we can expect no cooperation from Trimet. I’d be more inclined to do an e-bike mod to a tadpole trike, outfit it with full USDOT compliant lighting and every logical/compatible safety feature and ride such that I don’t draw ire from the mundanes. TriMet policy was changed a few years ago to allow recumbents the size of a standard bike on MAX. But many recumbents pose a challenge. Agree, Trimet really has to do something about the two bikes per bus policy. The buses that are infrequent that go WAY OUT of inner Portland cannot handle the demand. Bicyclists want to take their bike with them wherever they are going, not just park it in some secure spot. I’m not sure why they won’t install the 3 bike racks like up in Seattle, I think its “vision” or something to that effect. How does Seattle do it then? Of course if Bicyclists can park there bike in a secure location and at the next destination can pick up another bike for the remainder of that trip , problem would be solved. This is a serious problem from my point of view, too many people get turned away. Good point about the 3-bike racks on buses. I thought that Trimet was looking into that. Have they made any decisions on upgrades or specs for new buses, at least? 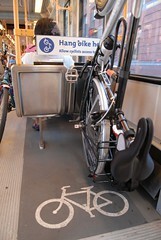 The 3 bike Sportworks racks are tougher to abopt due to conflict with bus head lamps and turn signals. I have used them and they help but are not as easy to use especially for urban bikes with racks, bags, etc. A better (interium) plan would be for Trimet to adopt a bikes on board policy for non peak periods and suburban routes. CTRAN allows this. I have seen it work well. Tight turns also present a problem in downtown Portland. TriMet is providing feedback on a prototype that could addresses this problem (as well as lights and visibility), but it hasn’t been solved yet. We haven’t looked at allowing bikes inside the bus, but most TriMet routes are too busy – even off-peak – for that to work well. There is also a concern about what would happen in the event of a hard stop. I’ve seen drivers allow this on my commute back home and been deeply grateful to them at second hand, knowing that if I were the one left behind I’d be disappointed and inconvenienced. (I’m not, because I get on at the first stop.) The bus is infrequent and not very busy, the bikes fit fine in the front. It would be a problem if there were a wheelchair user, but I’ve never seen that conflict occur. If busy buses are an issue, then a bikes-inside policy could mention that this is only allowed when the bus is not busy. That’s how most systems with capacity issues handle alternative access. Folding bikes are the only solution that will meet the needs of commuters if we get the mode share that planners are working for with our current busses and trains. Maybe in the future, there will be busses and train cars specially designed to transport people with bikes. Even now, the bikes on the front of the bus or a corner of the train car is very quickly getting to the point of not being reliable enough for people to use. I tried riding the bus with my bike from downtown to Tualatin this last winter and finally gave up. It was 50/50 whether I was going to get a spot on any given day – and that’s in the winter. The next bus didn’t come for more than 30 minutes. I finally decided to risk the Barbur corridor of death instead. I ride for the mother earth.. great story,, how I live my love in the PNW. My engineer brain is starting to buzz now – how about a trailer towed by the busses that would hold up to 10 bikes with built in bike locks and a camera on the back of the bus? It would be easier to mount than the present racks and could be swapped out for repair. You could even have some extra longs spots for recumbents and tandems. 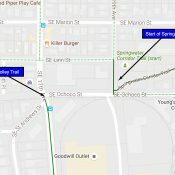 I do a bike-rail-bike commute at least 3 times a day from North Portland to deep SE. I really enjoy it. 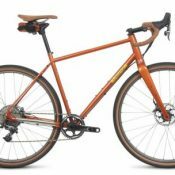 Breaks up commute to switch modes. If it were not for light rail I would not work where I do. I know that education has its limits, but has TriMet considered at least trying to ask Max riders to not clog the area around bike hooks when other space is available? Just this weekend my wife and I had a very difficult time getting our bikes on and off the Max because of the number of people standing right around the bike hooks even though there was lots of other open space in the train (even lots of empty seats). I don’t want to be pushy or rude, but it’s hard to get a bike on or off the train without banging into people who insist on standing between the bike hooks and the doors.